For those that are not aware of it, every two years FIDE (International Chess Federation) puts on a Chess Olympiad. This is not associated with the normal Olympics (not yet anyway). Each country fields a team of 5 players. Only 4 can play each round. Today was the first round. This year there are 158 teams playing in the open section and 124 teams in the women's section. Both US teams are off to a great start with 4-0 wins over their opponents (The men played Jordan and the Women played New Zealand). Both teams were ranked 5th overall by average rating going into the tournament. Here is the web site for the tournament. 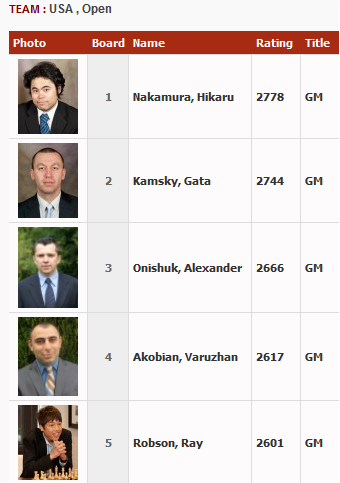 On there you can view games, pairings and results. Each morning as the round is underway you can also watch a video with analysis of the games in progress. UPDATE: In the open section, the USA men finished in 5th place. It was a big win for the nations of the former Soviet Union. Taking Gold was Armenia, Russia took Silver and Ukraine Bronze. 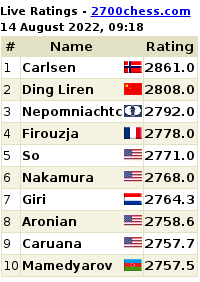 China was in 4th place showing how strong that countries players have become. 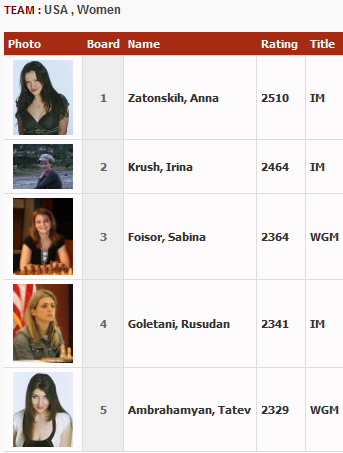 In the Women's tournament, USA placed 10th. Taking Gold was Russia, China Silver and Ukraine Bronze.